After a day of R&R at Big Sur campground, everyone was ready to tackle the day. Our daughter was feeling better, Tim thought his knee could handle a short day and we were ready to get back on the road. Our Big Sur hiker/biker campsite campmate, Jay Dancing Bear, gave us the scoop on the next stretch of the coast. Jay reported that the sparsely populated and rugged coastal area would be the best part of our tour. He’d been traveling this area for more than 20 years and had some strong opinions about the set of campgrounds, beaches and services. Jay Dancing Bear suggested we take the next section of the tour slow and to relish the tranquility of the remaining section of Big Sur. He scouted our Adventure Cycling maps and told us where he would camp if he was us. We appreciated the inside tips and settled on Plasket Creek campground, a forest service campground 33 miles south. Our friends, whom we traveled with last summer on the northern portion of the Pacific Coast stayed at Kirk Creek campground when they passed though Big Sur last year. They reported it was beautiful but had no potable water. They left the campsite thirsty and dehydrated and suggested we aim for Plasket Creek instead. 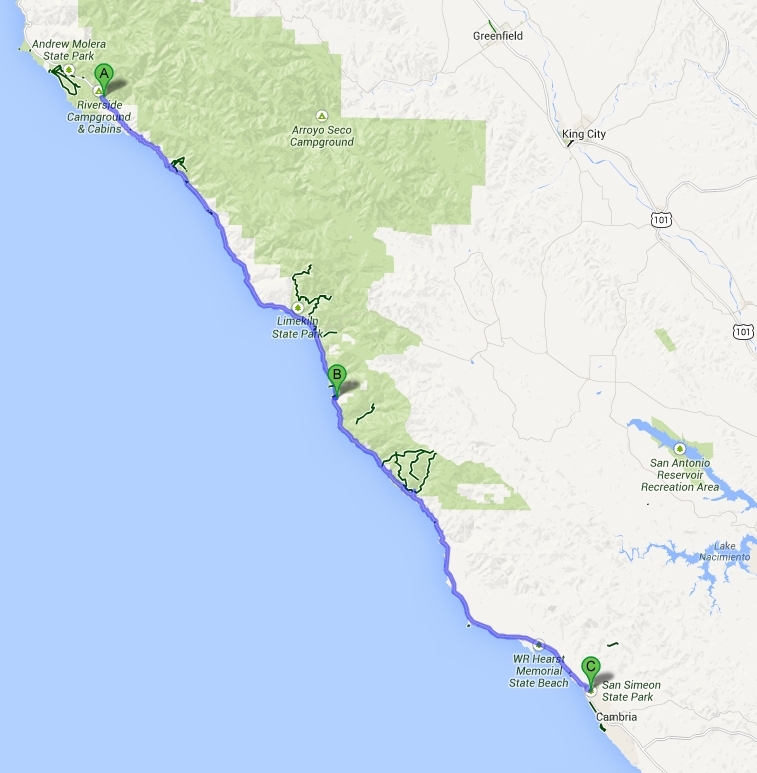 A little tip about grocery stores in the Big Sur area: they are scarce and expensive along this stretch of coastline! We stocked up on groceries at the small store three miles from the Big Sur campground, still more expensive than a splurge at Whole Foods, but still cheaper than grocery options further down the road. The views along this stretch are amazing and we stopped often to take it all in. We’d traveled this road in our VW van 9 years previous so we thought we knew what to expect. Bikes are better! The beauty of traveling by bicycle: you go so slow that you see so much more and it’s easy to pull off the road if you need to. About an hour into our ride, we saw birds flying above us and lots of cars stopped on the roadway. I told my stoker I thought they were Turkey Vultures. He replied, “No, mom, those are California Condors.” I didn’t believe him, California Condors are rare, I was sure they were just Vultures. He insisted and it turns out he was right. I guess I should trust my animal loving kid who knows more than me! We pulled off the road and marveled at the giant birds for a while. 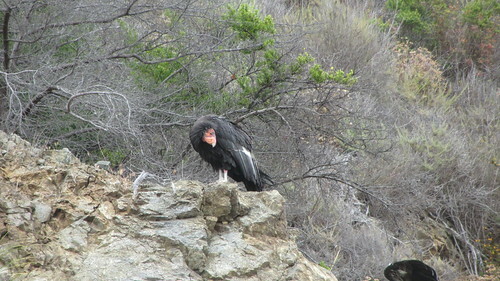 Condors are ugly, but amazing creatures! We continued down the Coast, stopping often to enjoy countless beautiful vistas. The waterfall in Julia Pfeiffer Burns State Park was visible from the road, saving our Sur-wearied legs a climb down to the beach and back. Early in our ride, we pedaled around a bend and heard drumming. As in full drum kit drumming. We were a bit confused and had to stop to investigate the source. A guy had set up a full drum kit at the edge of a cliff and was jamming away. Only in Big Sur? Or only in California? I can’t decide. He entertained us with fresh beats while we enjoyed the view. We continued riding and enjoying views the rest of the day. We saw so many obviously rented convertibles, the quintessential CA Coast rented car, that the kids started counting them to pass the time. One kid counted all convertibles, the other counted only red Mustangs. After the counts got into the hundreds they lost interest but they continued to play varied versions of Slug-Bug throughout the trip. The rest of the ride went pretty fast, only 20 miles that day. We arrived at Plasket Creek campground in a dense fog that threatened rain. We set up camp in a regular site instead of hiker/biker because we were hoping to be further away from the highway. We met Brad from Santa Cruz who was camping with a group of families. Our lack of liquid refreshment was pretty apparent so he brought us a couple of Sierra Nevada Ales and chatted awhile. Later he invited the kids over to his site for S’mores. Apparently a family on tandems is a rare sight in these parts. We went down to the beach after dinner and let the kids play on the edge of the water. Don’t get in the water, kids, this campsite doesn’t have showers! The parents were content to sit on the beach and watch them play. High: All of Big Sur, especially the Condors. And of course, the drummer. After taking down camp, we planned to ride to Gorda, the next town, for coffee and breakfast. The camp host at Plasket Creek called Gorda, Gouge-a because all of the services are so expensive. We pulled up to the restaurant and store and saw some other bike tourists. I recognized one of them from our tour last summer. It turns out my face recognition skills did not fail me, it was the same kid, Zeke, who had toured with his dad the previous summer and we had met them in Ferndale. This summer he was riding from San Diego to Astoria. On his own bike! And he’s 12! We found the cheapest item on the menu at the highly overpriced cafe in Gorda: grilled cheese and french fries. Tim stuck with coffee and bottom of the pannier food. Since Zeke and uncle had just come from the South, they filled us in on the next stretch of road. Big climb, then a descent, then another big climb. I was really really grumpy from the wet wake-up and was not a pleasant riding partner. Nor was I cheerful when a group of three roadies passed us on the climb and suggested we pack lighter next time. The three of them were “credit card touring” from San Francisco to Santa Barbara and each was carrying a small backpack. Try hauling kids up this climb on a tandem and let me know how it goes for you! Don’t worry, grumpy lady kept all of those thoughts to herself. We climbed in a dense hot fog, it felt like Hawaii. It would have been beautiful had we been able to see farther than 20 feet in front of us. We arrived in San Simeon, to an elephant seal habitat. Hundreds and hundreds of elephant seals lounging on the beach. The ranger said they were mostly teenage elephant seals and the reason many of the males were fighting. Elephant seals all over the beach as far as we could see. Our son was so happy he remembered his binoculars this trip, they are getting lots of use! After watching the seals, we set off for our camp for the night, San Simeon state park. First we needed a few groceries. The Adventure cycling maps had a symbol for a grocery store just before the campground. Perfect. We planned to pick up some dinner supplies before heading to camp. We arrived and the grocery was really just a mini mart with the coldest beer in town and lots of snacks. We asked around and found out there was not a real grocery in town. We thought about eating out, but none of the overpriced restaurants looked very appealing. So I went back into the mini-mart and got a few things for dinner: eggs and fruit loops and Tecate! The kids thought it was hilarious! 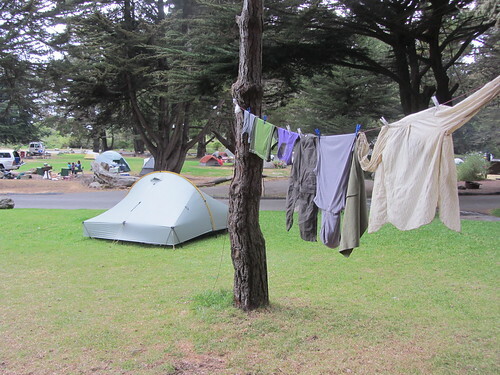 The hiker/biker site at San Simeon State Park was super close to the highway. This was the most populated camp of the trip, five different bike touring groups trickled into camp as the evening wore on. It was fun to see so many bike tourists in one place. So far, the Southern part of the Pacific Coast route has been pretty lonely, lots of cars but not many bike tourists. 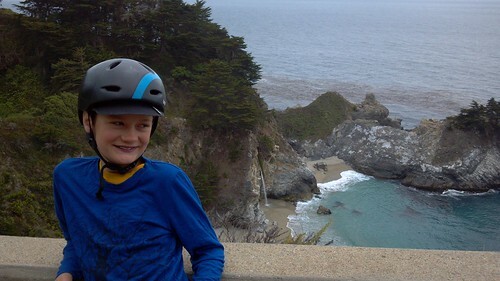 This entry was posted in bikes, Pacific Coast Bike Tour and tagged 2013, acapaccoast, bike touring, bikes, CA, carfreedays, family, family bike touring, Family Cycling, June, kids, Pacific Coast Bike Tour, Pacific Coast tour, tandem, tandem bike tour, two tandem bike tour. Bookmark the permalink. Sorry about the racer boy CC tourists, glad you didn’t let them get you down…. They wouldn’t have bothered me on any other day, my grumpiness let them under my skin. They were just happy to be there and enjoying the climb. But, man, I would have paid good $ to switch bikes with one of them so they could see what it’s like to haul a kid (who doesn’t always put a good effort into the pedals) up a huge climb on a loaded tandem!